Hon. Emmanuel Armah-Kofi Buah is a native of Ellembele in the Western Region of Ghana. He is a management professional. Hon. 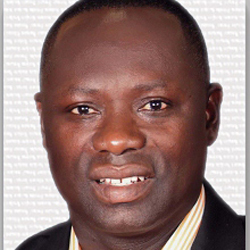 Kofi Buah has academic qualifications in law and management from the Kwame Nkrumah University of science and technology of Ghana and the University of Maryland, USA respectively. He has held several management positions locally and internationally, in the process deepening his expertise in project management, finance, marketing and investor and international relations. In the last few years, he has applied these management skills in his position as Member of Parliament for Ellembele, working with the District Assembly in his constituency to deliver on their respective district planning and development obligations. He was Deputy Minister of Energy in a period when Ghana gained global attention for commercial oil and gas production from the Jubilee field. In this capacity, he supported the Minister in managing the various sector agencies and departments under the Ministry to deliver effectively. He has managed various local and national stakeholders with regard to Ghana’s Energy sector, all the while employing his management skills. His legal knowledge has also been applied in the development of various legislative instruments pertaining to the Energy sector.